I can tell that Dreadnought requires a lot of tactical knowledge, and I don't have it yet, which makes it a tough game to get a read on after just a couple rounds. The quick pitch: It's giant spaceships, something I'm fond of, blowing up other giant spaceships with primary and secondary weapons, missiles, torpedoes, and all sorts of special abilities as they very slowly crawl over planet surfaces. Right now, there are two modes, Team Deathmatch and Team Elimination. I played Team Elimination at PAX East yesterday, and it works like you'd expect: each player has one life per round, and the last team standing wins. It's a best-of-three rounds deal, and without much tactical understanding, it's pretty good fun from a superficial, 'look at these big spaceships do war to each other' way. 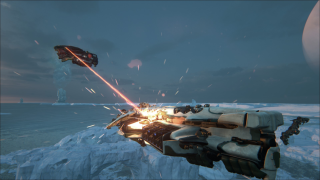 Some things concern me about Dreadnought so far, though. The ships steer in arcs that I found awkward (like, even for giant spaceships), and I had trouble adapting to the control scheme and efficiently managing my ship. Left mouse button is primary weapon, and right mouse button—rather than being the secondary weapon—is zoom. A key switches LMB between the primary and secondary weapons, which just doesn't feel right to me (update: partially because it was hard to tell which weapon I had selected, and needed to quickly make decisions about which to use). The middle mouse button, meanwhile, opens a radial menu where I can direct extra power to the engines, weapons, or shields. And at the same time as all this, I'm managing my ability cooldowns, and trying to read little icons on enemy ships which tell me if my torpedoes are locked on or if I'm just going to shoot them at the ground. And my enemies, which can be above me, below me, or behind me, are using jump abilities to warp around. It's a tough game. A high skill cap isn't bad, of course, and at this point I've hardly played any matches. More time with it will tell if it's awkward, or just full of challenging tactics, but at the moment I find Dreadnought a bit convoluted, and it hasn't immediately grabbed me (I'm not fiending for another round like I was when I first played Tribes: Ascend, for instance). The most fun I had in Team Elimination actually came from a feature that directly opposes Dreadnought's 'big slow capital ship' design. If you're eliminated, you don't have to sit and wait for the round to end. Instead, you come back as a small fighter ship (it's still pretty slow, to be fair). Your weapons are simple, and your goal is simple: find limping ships and finish them off so your teammates can get out of fire and recover from damage. I actually did best as a fighter. The good news, I hope, is that finding out if Dreadnought is your sort of giant spaceship game shouldn't cost you anything. It will be free-to-play, and in my brief chat with Peter Holzapfel in the video above, he expresses a desire to keep non-paying players happy with the competitive balance. Of course, everyone making a free-to-play game says that, but I don't feel pessimistic about this one.